For some of you who are reading this God is telling you “I want to spend time with you, but you are not listening. I love you and I want to talk to you, but you are throwing me under the rug. You lost your first love.” We treat God as if He was that annoying parent that we see in movies. When the kids were younger they were saying, “mommy mommy daddy daddy,” but as they grew older and became teenagers everything their parents did became annoying to them. At first you were on fire, but then God became annoying. You used to run to the prayer closet. You lost the passion you once had for the Lord. You remember those days you used to pray and you knew the presence of God was there. Have you lost the presence of the Lord in your life? Has something else replaced it? TV, Instagram, the internet, sin, your other half, work, school, etc. When you are not making time for the Lord you are not only killing yourself you are killing others. Whether you want the responsibility or not God saved you and some of your friends and family members are still unbelievers. You are responsible for weeping for the lost around you. Some people will be saved because of your prayer life. God wants to show His glory through you, but you have neglected Him. I don’t care if you can recite Scripture. I don’t care if you’re the greatest theologian ever. If you’re not getting alone with God you’re dead. There is no such thing as an effective preacher who doesn’t have a prayer life. I’ve been to churches where the pastor never prayed and you can tell because everybody in the church was dead. There are so much things that you desire. You want that family member saved. You want to know God more. You want God to provide for you. You want help with a particular sin. You want God to open a door to advance His kingdom. You want God to provide you with a spouse, but you have not because you ask not. How can Christians forget to pray? Maybe you pray one day then a week later you pray again. No! You must bleed, sweat, and endure in violent prayer with God daily. Shut up and stop all the noise! Get away. Who cares if it’s only for 15 seconds? Pray! Set a daily prayer time. Talk to God when in the bathroom. Talk to Him like He was your best friend in front of you. He will never laugh at you nor discourage you but only encourage, inspire, guide, comfort, convict, and help. 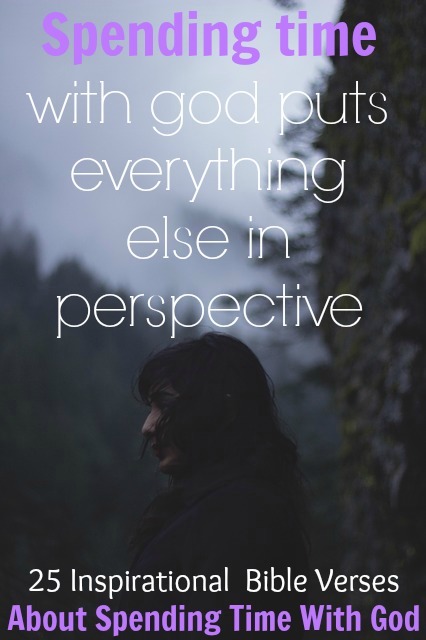 “Spending time with God puts everything else in perspective. 1. Jeremiah 2:32 Does a young woman forget her jewelry? Does a bride hide her wedding dress? Yet for years on end my people have forgotten me. 2. Isaiah 1:18 “Please come, and let’s reason together,” implores the LORD. “Even though your sins are like scarlet, they’ll be white like snow. Though they’re like crimson, they’ll become like wool. 3. James 4:8 Come close to God, and God will come close to you. Wash your hands, you sinners; purify your hearts, for your loyalty is divided between God and the world. 4. James 4:2 You want what you don’t have, so you scheme and kill to get it. You are jealous of what others have, but you can’t get it, so you fight and wage war to take it away from them. Yet you don’t have what you want because you don’t ask God for it. Jesus always found time to pray. Are you stronger than our Lord and Savior? 5. Matthew 14:23 After sending them home, he went up into the hills by himself to pray. Night fell while he was there alone. 6. Luke 11:1 Once Jesus was in a certain place praying. As he finished, one of his disciples came to him and said, “Lord, teach us to pray, just as John taught his disciples. Is your love for God the same as it was before? You have been enduring. You have been walking upright. You have been doing many things for God’s kingdom, but you lost that love and zeal you once had. You have been too busy for God that you haven’t been spending time with God. Make time or God will find a way for you to spend time with Him. 7. Revelation 2:2-5 I know what you have done—how hard you have worked and how you have endured. I also know that you cannot tolerate wicked people. You have tested those who call themselves apostles but are not apostles. You have discovered that they are liars. You have endured, suffered trouble because of my name, and have not grown weary. However, I have this against you: The love you had at first is gone. Remember how far you have fallen. Return to me and change the way you think and act, and do what you did at first. I will come to you and take your lamp stand from its place if you don’t change. We must stop trying to do things in the power of the flesh. We must rely on the strength of the Lord. Apart from God we can do nothing. 8. Psalm 127:1 If the Lord does not build the house, it is useless for the builders to work on it. If the Lord does not protect a city, it is useless for the guard to stay alert. 9. John 15:5 I am the vine, ye are the branches: He that abideth in me, and I in him, the same bringeth forth much fruit: for without me ye can do nothing. Shut the noise around you! Be quiet, be still, listen to the Lord, and put your focus on God. 11. Psalm 131:2 Instead, I have calmed and quieted myself, like a weaned child who no longer cries for its mother’s milk. Yes, like a weaned child is my soul within me. 12. Philippians 4:7 And the peace of God, which passeth all understanding, shall keep your hearts and minds through Christ Jesus. 13. Romans 8:6 For the mind-set of the flesh is death, but the mind-set of the Spirit is life and peace. 14. Isaiah 26:3 You keep him in perfect peace whose mind is stayed on you, because he trusts in you. 15. Psalm 150:1-2 Praise the Lord! Praise God in his sanctuary; praise him in his mighty heavens! Praise him for his mighty deeds; praise him according to his excellent greatness! 16. Psalm 117:1-2 Praise the Lord, all nations! Extol him, all peoples! For great is his steadfast love toward us, and the faithfulness of the Lord endures forever. Praise the Lord! Talk to God about everything at home, while driving, at work, in the shower, while cooking, while exercising, etc. He’s a great listener, great helper, and more than a best friend. 17. Psalm 62:8 Trust in him at all times, O people; pour out your heart before him; God is a refuge for us. 18. 1 Chronicles 16:11 Look to the LORD and his strength; seek his face always. 19. Colossians 4:2 Devote yourselves to prayer, being watchful and thankful. 20. Ephesians 6:18 And pray in the Spirit on all occasions with all kinds of prayers and requests. With this in mind, be alert and always keep on praying for all the Lord’s people. Spend time with the Lord by getting to know God in His Word. 21. Joshua 1:8 Study this Book of Instruction continually. Meditate on it day and night so you will be sure to obey everything written in it. Only then will you prosper and succeed in all you do. 22. Psalm 119:147-148 I rise early, before the sun is up; I cry out for help and put my hope in your words. My eyes are awake before the watches of the night, that I may meditate on your promise. Doing God’s will for your life always leads to time with Him. 23. Proverbs 16:3 Commit your actions to the LORD, and your plans will succeed. 24. Matthew 6:33 But above all pursue his kingdom and righteousness, and all these things will be given to you as well. The dangers of never making time for the Lord.